The “high places” of the Himalayas are the reason for and the source of the mighty river Ganges. The warm moist airs from the ocean rise up into the colder regions of the mountains and annually form the monsoons which deposit vast amounts of snow and rain on the land. This reinvigorates the soils with the nutritious and mineral rich silt deposits which flow down the myriad rivulets, channels and mountain streams before combining to create that most sacred of rivers to Hindus, the Ganges, the mother river to millions of Indians. After the winter storms and snows comes the warming influence of the sun and with its snow melt water. These torrents of water will pour down through the rivers and on through the Gangetic plains and deltas of North India and Bangladesh and ultimately onto the ocean in the Bay of Bengal. The “Ganga Mate” is the mother of Hindu worship who descended from heaven to earth and she is also the vehicle for the ascent from earth to heaven. It is the desire of all Hindus to have their remains returned to the purifying waters of the sacred Ganges. They believe that the river flows in heaven, earth and the netherworld, that which lies between the physical and spiritual worlds. It is called a “tirtha” or a crossing point of all beings, for the living as well as the dead. To Hindus the waters of the Ganges are considered to be both pure and purifying and that nothing claims order from disorder more. The sun was setting quickly as we slowly floated down the shining silken river on waves of tranquility. The river Narayana in the foothills of the Himalayas in Nepal was our host as it made its journey along with others to form the mighty Ganges. After the annual monsoons and the snows of winter when it was an unruly body of milky snow melt water bursting to be free, pushing and forcing its way along any course to find a way onward. Now the circling whirlpools, white water rapids, torrents and tumbling falls are calm. Gone, for now, the rivers in ferocious roaring and malevolent mood, foaming and falling from its high altitude home. Wide and clear now, for the heavy floods had long passed and the waters were now receding revealing the many shingle shoals, bars and islands all a product of the annual rebirth and renewal. The bankside trees began to lose their true colours, the birds were flying to their night time roosts, the light breeze was weakening and a chill descended. As we floated down the silver grey waters we were moved from one side of the river to the other. The currents, the “river of life” were taking control of our basic wooden boat. Was this a metaphor for life through its many trials and tribulations which result in changes of direction in life’s journey? Calm emotions had descended on all in the boat, no one spoke, and the sound of water rippling over the bankside shingles came and went as we moved with the stream. The two paddlers in the stern dipped their paddles slowly and deliberately in unison and the sounds of droplets of water falling from them added to the symphony of sounds. The current was taking us further down and directly ahead was the sight of the quickly setting sun. It was no longer the “golden globe of enlightenment” for the colour had gone and we were in an auditorium of platinum, silver greys, blue greys and with a hint of magenta. 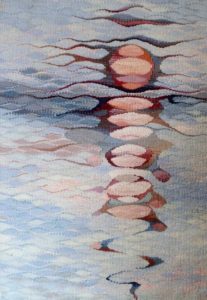 As it progressed to the horizon the reflections became broken and disconnected as the rippling water took over the sphere and created multi elements yet were still part of the whole. The sun was now in an intimate relationship with the earth, the atmosphere was full of emotion, highly charged and tinged with anticipation. As the sun settled lower and lower to the horizon it kissed the tips of the ripples and wavelets with soft flesh pinks, apricot and deep salmon tints. Whilst in the curling troughs darker colours reigned, hues of blues and steely darker greys, bronzed fawns and coppers. The earth, the sky and the water were now united into a single palette, it was difficult to discern the tree lined banks from the sky and the flows of the river added great movement and a tangible spiritual feel to the occasion. This was so similar to the experiences I have felt in the isolated and lonely deserts and other high places and indeed in the great cathedrals of Western Europe. We had entered into a natural earthly cathedral and not one created by man. Can I do justice to this sense of feeling and understanding, the concepts and ideas are very clear in my mind and a visual image has been established? I now know my colour palette must be restricted, disciplined and controlled yet with a wide variety of similar tones. I feel it must be an image which can stand alone and still create in the eyes of the viewer something of these elements that I am describing. Only time spent at the loom can say. This is when I not only weave but it is a time for a valuable opportunity to relive, to think and consider my aims, objectives and the underlying elements and search for further explanations and reasoning’s. Every session I spend at the loom I am being transported back to the event and recreate the experiences in my mind. I have photographs of the journey but they do not truly give the impression I saw and experienced, they are merely an “aide memoir”. A stepping stone for this tapestry came as a result of the colours from the drying head of a Hydrangea bloom. This shrub had given great pleasure during the summer and now in the autumn the colours captured brilliantly the colours of the sun set river journey. It renewed my experiences and thoughts and gave me the impetus to challenge this theme. I am reliving this spine chilling, almost spiritual, adventure. As in many other of my tapestries I have to include the sensation of light, the epitome of seeing and knowing. From the unknown, the dark night, to the known and the brilliant illumination of knowledge, understanding and possible enlightenment. For light comes from the future, looking always ahead at what is over the next horizon or around the corner we leave behind the past. Yet its experiences will affect how we see and view the oncoming. With my preparatory images created with water colour paints I am fully aware of the translucent quality of this media and the light which emanates from the paper. The dancing light on the rippling river water was full of hues and tones and constantly changing. There was much energy not only to cleanse and purify but also to renew. Our thoughts and our actions were being controlled by the currents, our journey must soon end for night was nearly upon us but our thoughts, like the Narayana, would continue. The river would eventually join with so many others to form the Ganges, and our understanding would develop with more of life’s experiences. We would be closer to a greater awareness of true enlightenment and to the links between the physical and spiritual worlds. Light was fading fast and the monochrome effect of dusk was becoming more and more noticeable. The chill was taking hold and as we moved closer to the bank the play of light on the water began to disappear, the sky was dark and foreboding yet the pattering sounds of the river on the shingle indicated that the river was alive. By the time we had clambered from the boat the light was all but gone and low over the horizon the rising moon was displaying all her charms. It was some time before my thoughts could depart and release me from such a wondrous experience and now years later it still holds my attention and provokes many unfathomable questions.